“Dudley hadn’t been well since last week, but a trip to the vets was inconclusive because Dudley always enjoyed trips out in the car so much that he seemed quite happy even before the vet had even reached for the rectal thermometer. After returning from the vets Dudley seemed fine until yesterday evening when, unusually for him, he wasn’t enthusiastic about eating his dinner, (although he did force it down after a few minutes). He snoozed quite soundly through the evening and seemed quite comfortable until about 11.30pm when it was time for all three of them to pop outside before I went to bed. The girls trotted out quite happily but it was immediately obvious that something was very wrong with Dudley, he initially had some trouble standing. I put this down to him being a bit stiff after a long walk in the morning and then lazing around for most of the day. As Dudley made his way outside I could see he was unable to control his hind legs properly and once outside he flopped to the floor and didn’t want to move. I knew Dudley was in trouble and I believe he knew it too because he didn’t protest or wriggle as I carried him back inside and laid him gently on the floor in the lounge. I woke Rachael who phoned Dudleys vet Becky Tee and described his symptoms to her. Stroke and circulatory problems were discussed at length but, as he wasn’t in obvious pain we wrapped him up warmly, massaged his back gently and gave him small sips of water via a large syringe to keep him hydrated while we waited anxiously to see if he stabilised or improved over the next 30 mins or so. We knew we could get him to the vets within 10 minutes if necessary. 10 minutes later Dudley stood up, a little shakily, and clambered up and onto the settee like the right cheeky git he sometimes was. Under the circumstances we allowed it and wrapped him up warm with a heated gel pack and watched him as he gradually relaxed into sleep. I opted to sit with our boy and Rachael retired to bed, (I didn’t have to be up for work the next morning , but she did). Dudley laid his head on my lap and it wasn’t long before he was snoring contentedly as I stroked his head and spoke softly to him – something I had been in the habit of doing to all three of our dogs since they were puppies. Shortly afterwards I was snoring too. Dudley woke me at 3.55 by shoving a paw into my face. I looked at him and was pleased to see that he looked much better, his eyes were clear and he was alert. I stood up and asked him if he wanted to go outside and he started to rise…..
….and, as he stepped off the settee, I saw to my dismay that he was now struggling to control any of his limbs and he flopped sideways to the floor. I knew that he wasn’t going to get up again and, after soothing him for a few seconds, I rushed upstairs and shook Rachael awake again, “I think our boy is dying” I told her, and we both sprinted downstairs to find Dudley still conscious but fading rapidly. As I held his head in my hands, stroking him gently and, trying to hide from him how upset I was lest I frighten him, I told him over and over: “You’re a good boy Dudley, it’s okay, you’re a good boy”. Rachael stayed composed long enough to page the vet but just as the phone rang, and she began talking to the vet, Dudley took two or three large, shuddering breaths and died in my arms. I don’t think he was in much pain and I’m very glad that he died being held and comforted in familiar surroundings rather than in the back of the car on the way to the vets, or in the vets itself. He died at home and he wasn’t alone – that is very important to us. Joined by Ben, Gem and Tia, the five of us sat with him for the next hour until the time felt right to take him for his last ride in the car. In ten days or so we’ll pick him up again, in a small but nicely done beech casket. I can imagine that some of you reading this will wonder why we wanted to share this and the answer is simple. 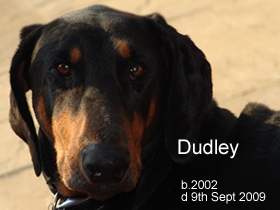 Many people met Dudley during his short life, (7 years is quite short for a Dobermann) and most all of them appreciated thathe was a friendly, loving, funny, naughty, thieving, obedient/disobedient, bin-raiding, farty-arsed, clumsy boy he was. He was also a remarkably sensitive and thoughtful dog. Dudley was, in every sense of the phrase, ‘an ambassador for his breed’. Well, we’ve now been without Dudley for 365 days and I’m pleased to report that the girls, Gem and Tia, adjusted to life without Dudley very rapidly and, for them at least, pack life returned to normal very rapidly. I can’t speak for Rachael but I miss Dudley as much today as I did on the first day without him. I’ve never quite got around to getting rid of his bed, his bowl, collar, dogtag or lead….and I’m not sure that I ever will, or will ever want to. Dudley isn’t the first dog I’ve said goodbye to, yet there is something profoundly deeper and longer lasting about losing him than I’ve experienced before. Perhaps it’s because Dudley really did have an unusual personality for a canine, or maybe we just enjoyed a very strong bond, but whatever it was it ain’t going away quickly, and for that I am actually very glad. Pam Ayres wrote a short poem called Tippy Tappy Toenails. I like it a lot. The days are slowly passing since I found her still and prone. Since I took her to the surgery and came back on my own. Are the tippy tappy toenails as they skidded down the hall. In the jingle of her collar and ecstatic doggy smile. It’s the silence, oh it’s the silence, it is blacker than the night. That little dog convinced me I was someone’s one and only. Without the music of her tippy tappy doggie dancing feet.